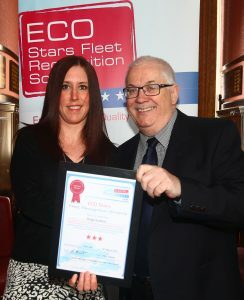 The ECO Stars scheme provides recognition for best operational practices, and guidance for making improvements. The ultimate aim is to reduce fuel consumption which naturally leads to fewer vehicle emissions and has the added benefit of saving money! Members are awarded an ECO Star rating when they first join – ranging from 1 Star to 5 Stars – based on an assessment of their current operational and environmental performance. One of the ECO Stars team (all industry experts with years of transport experience) rates each individual vehicle and how the fleet is run as a whole.